The digital channel is quickly establishing its status as the place where today’s consumers, small and medium-sized businesses (SMBs), and commercial enterprises go for their lending needs. There are predictions that digital lending could be an “addressable market” of $1 trillion in the U.S., and loan origination volumes could reach $90 billion by 2020, from about $25 billion in 2015. Only half of larger banks and just 38 percent of smaller banks cited in an ABA report on the state of digital lending are using a digital loan origination channel. To take advantage of these opportunities, financial institutions (FIs) must meet borrowers’ expectations of easy, fast, and hassle-free experiences. By adhering to today’s best-practices approach to digital lending, FIs will deliver these experiences. User experience (UX) is important. However, the UX should be backed by modern back-end processes. Some providers tout a modern UX look and feel while older technology grinds away behind the scenes, rendering a less than satisfying experience. FIs dependent on slow digital-lending technology—namely, platforms tied to legacy cores and cobbled together from various systems—won’t deliver the kinds of borrower experiences sought from account holders and today’s prospects. Neither will they provide the effectiveness that loan officers, underwriters, compliance officers, and loan operations staff want in meeting their daily workloads. 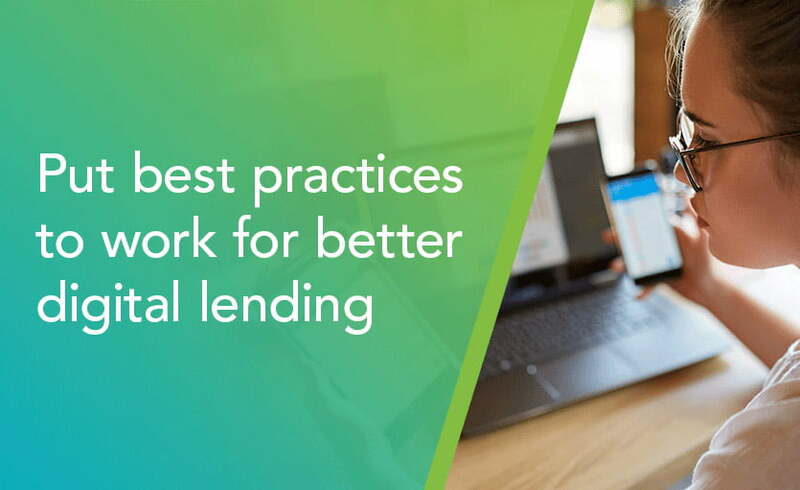 Given that everyone involved in the lending process can be negatively affected by lending technologies that are slow, prone to technical issues, and inefficient, it’s important to be certain a provider is committed to using today’s best practices. The ability to configure to your specific needs and create out-of-the-box integrations and workflows allows an FI to quickly create new lending products and deliver them to market. Look for a unified, configurable platform to support consumer, SMB, and commercial loans—one that will deliver an overall lending process that is timelier and more efficient as well as scalable. A full front-to-end single platform—with straight-through processing and the ability to configure without engineering resources—works well. The ability to configure to your specific needs and create out-of-the-box integrations and workflows also pays great dividends by allowing an FI to quickly create new lending products and deliver them to market. Fintech-like experiences are increasingly sought by borrowers. Such experiences can be produced using no-code, API-based technology. Responsive technology without complexity and manual workarounds drives these experiences. Equally important, seek a digital-lending provider who can implement and integrate to Core, Doc Prep, Imaging Systems, and Credit Bureaus much faster and smoother; one that also meets Know Your Customer requirements thoroughly. Faster speed to implementation is changing digital lending. Today, there are lending platform providers available to remove the need for expensive engineering resources, extensive customization—and the long waiting period for promised enhancements. The processes and expertise are in place to get an FI up and running in six months or fewer. At the same time, there remain those providers less prescribed to considering new ways of delivering integration, and they often have implementation timelines of up to two years. There is no reason why an FI should remain hindered in the age of digital lending. There are many opportunities to grow revenue in this channel, if the right digital-lending platform is in place—one founded on today’s best practices and providing great experiences to borrower and lender, alike.